Conventional wisdom is that children in the wedding party wear party clothes which are essentially mini-versions of wedding specific attire worn by the adults. So page-boys and ring-bearers (why are they always boys?) wear little suits, or formal shirts, trousers, and vests, and flower girls wear long dresses with sashes, or, increasingly, tulle skirts a la ballet tutus. Boys wear ties and girls wear flower wreaths on their heads. 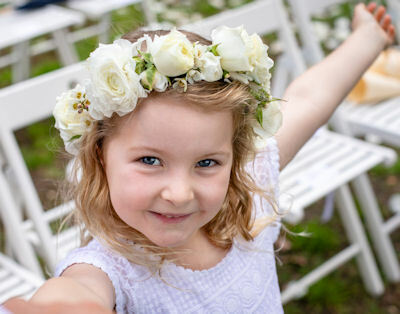 Safety issues apart (most fabrics flower girl dresses are made from are highly flammable), many wedding-specific outfits for kids are not particularly comfortable. They might be hot, they might be scratchy, they might restrict movement, they might come with lots of rules, and they might just make the kids feel a little silly. It doesn't have to be like that. There are many age-appropriate, original, and even quite funky choices out there in the market place which be more comfortable and more fun for the kids to wear. And, as I tell all my brides and grooms, it is not a coronation. It doesn't have to be planned to the last second. There is room for spontaneity, for the unexpected, and for everyone, bride, groom, bridal party, and guests, to just be natural and themselves. And there is nothing more appealing than a happy, confident child strutting their stuff down the aisle, and doing their own thing. Case in point. This last weekend I officiated an outdoor wedding under a gorgeously twisted old tree. The bride and groom had planned a low-key wedding with no bridal party. But the bride's 4 year old niece desperately wanted to be a flower girl and walk down the aisle. But she also didn't want to wear a flower girl dress. On the day, dressed in her favourite mix of clothes (she dressed herself), carrying a bunch of flowers, and wearing her beloved pink backpack, she confidently strutted down the aisle, with a grin from ear to ear. No tears, no fears, no resistance. It was a wonderful opener for a love-filled family occasion. Take-home message? If you focus on the feel, rather than the look, if you ensure that any children included in your wedding are relaxed, happy, and that their wishes and needs are respected, you won't have any awkward moments with children baulking at carrying out their designated roles, no tears, and no tantrums. Just natural, joyful behaviour and lots of smiles from everyone.